Most of the property, if not all, in Nottingham Road was old, some of it very old indeed. Standing back from the road, and in gardens, were some old cottages, in one of which lived Mr. Wardle. Like his wife Martha Deboard, needlemaker James Wardle was born in Coleorton, Leicestershire, and after their marriage in September 1835 the couple lived in that county before coming to Ilkeston in the early 1850’s, with children Sarah Ann and Joseph. Their son John Thomas was born in Ilkeston in February 1854. James was initially employed by needlemaker Benjamin Tatham of Kensington and the family lived in Nottingham Road. He had two sons, Joseph and Thomas, both were musical, Joseph being a violinist, Thomas, I believe, played the cornet. — James also had a daughter, Sarah Ann, born in 1835, who married joiner Amos Johnson, eldest son of joiner James ‘Jimmy’ Johnson and Jane (nee Bramley) in July 1859. After this the couple went to live in Sacheveral Street, Derby – where daughter Sarah Ann junior was born in August 1859 — then on to Stoke Prior, Worcestershire in the mid-1860’s, before returning to Ilkeston about 1875 with six children, to live in Tutin Street and then in North Street. Amos died in that street in November 1902 and Sarah Ann continued to live there with her son and joiner Albert and his family before going to live with daughter Sarah Ann and her husband Isaac Meer, a needlemaker, in Albany Street. At the May General Election of 1929 the Ilkeston Advertiser calculated that Sarah Ann was probably the oldest person in the town to cast her vote, and walked both ways to the polling station to do so. She was then aged 93. When her daughter Sarah Ann junior died in November 1931, Sarah Ann senior moved on to live with her elder son, grocer Herbert Johnson, in Lenton, Nottingham and she died there in April 1935, aged 99. Almost up to her death Sarah Ann was reported to be in good health, wonderfully active, a keen reader of newspapers and with a lively interest in current affairs. On Sunday evenings she would enjoy listening to son Herbert play hymns on his organ, singing along with him. 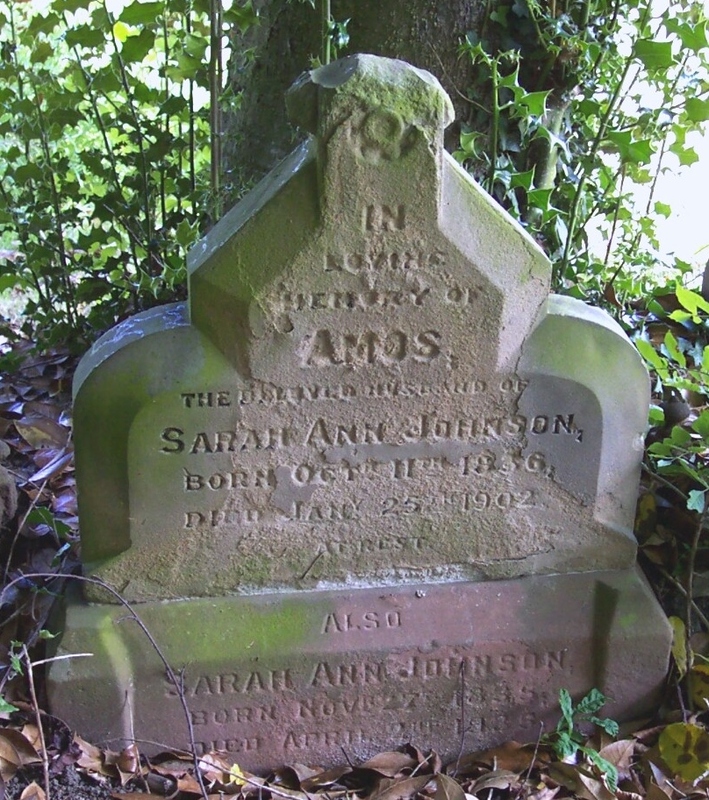 She is buried in Stanton Road cemetery with her husband Amos. — Elder son Joseph married Mary Bamford, daughter of Ilkeston Common blacksmith John and Eunice (nee Tatham) on New Year’s Eve of 1865 and thereafter lived in Regent Street, initially with Mary’s illegitimate daughter alias Martha Bamford Wardle, born in August 1862. Their first seven children after their marriage, all girls, were born in Regent Street and about 1881 the family moved into Belper Street, where daughter Maud and son Lawrence were born …the latter died there in 1886, aged six months. Like his father and younger brother, Joseph was a needlemaker and all three worked at the firm of Amos Tatham and Son on Belper Street. In his recreation time Joseph was an accomplished musician and for a number of years played first cornet in the Ilkeston Brass Band in which he also acted as leader, a post later taken on by his younger brother. “Ilkeston Harmonic Society….Presented to Mr. J. Wardle, by the members, as a token of their appreciation of his services as leader of the band. April 27th 1883”. For its Christmas Concert of 1884 the Society gave what the Nottinghamshire Guardian described as one of its most successful concert so far, at the Ilkeston Town Hall before a large audience. Haydn’s ‘Creation’ was performed, with a band and chorus of 120 performers; Joseph was leader of the band and Harry Stanley Hawley played the harmonium. Joseph had “composed numerous pieces of music, including selections of dance music, etc., and was much esteemed by all who knew him for the uprightness of his character and his devotion to the art which cost him so dear”. (IA 1887). “His services in musical parties and public performances were incessantly required, where his gentle and unassuming manner gained him hosts of friends and warm admirers. But the strain involved on poor Wardle by his numerous engagements in connection with his position at the factory, his teaching of pupils, and his untiring devotion to the Harmonic Society (which owes its success largely to his exertions as leader), over-taxed his brain, and contributed to his utter collapse and premature decease”. About 1884 Joseph was forced to give up work and died in Belper Street in March 1887, aged 44. His coffin was accompanied from his home to the Baptist Church in Queen Street and thence to the General Cemetery by the Ilkeston Brass Band, playing Handel’s Dead March and led by his brother Tom. Joseph’s widow Mary then went to live with her eldest child Martha and family at Brightside Bierlow, Sheffield. In January 1889 Martha had married engine fitter Sandiacre-born John Goddard, son of lacemaker William Rawdin Goddard and Maria (nee Ball) – and thus related to the Burr Lane Balls and Goddards. — In October 1875 son John Thomas Wardle alias Tom married Ann Bonser, daughter of boatman Thomas and Millicent (nee Plumb). Again, there was already an illegitimate child in the family — Samuel Thomas Bonser alias Wardle born in May 1874 — and after the marriage he was joined by nine other children. Tom was a cornet player and one-time leader of Ilkeston Brass Band, a role he assumed in January 1876 when Samuel Aldred retired. In September 1879 he won a silver-plated cornet, value 14 guineas, for the best cornet solo, at the first annual brass band contest on the Lawn Grounds at Sutton-in-Ashfield. The proud contest-winner put his prize on display in the shop window of draper Edwin Sutton (at Criterion House, 24 & 25 Bath Street). This was Tom’s second prize of the year as in July he had won a contest at Long Eaton where the prize was an instrument to the value of nine guineas. In the 1930’s Tom was bandmaster to the Ilkeston Borough Band and led the Ilkeston Ambulance Band. In his weekly Pioneer column in December 1932 journalist ‘the Rambler’ described ‘the town’s veteran bandmaster’ as an outstanding example of ‘a music enthusiast’. The writer had seen one of Tom’s faded and yellowing photographs showing the Ilkeston Prize Band in 1864, its members appearing in civilian clothes, three of them arrayed in ‘top hats’. “It might popularly be presumed that these were better circumstanced than the other members of the band. The complete band was as follows:– Fred Flint, James Baker, sen., Matthew Baker, Aaron Baker, Joe Wardle, Amos Boam, William Goddard, Brannon, John Philips, John Goddard, Samuel Aldred, James Baker, Henry Harrison. “Fred Flint was a well-known local tailor, and naturally was amongst the wearers of ‘top hats’. “Joe Wardle was a brother of Mr. Tom Wardle. “Amos Boam was the landlord of the King’s Head and John Goddard of the Anchor Inn. “A brother of the latter, who does not appear on the photograph, became the musical director at Buxton Pavilion. The musical tradition still runs in the family of William Goddard, who was a lace-hand and a fine figure of a man. “Fairly numerous descendents of the Bakers are still in the borough. “Henry Harrison was the drummer in this Ilkeston band of 68 years ago. He is remembered chiefly for his fondness for parading with a ‘pyenet’ (the local name for the old-fashioned large red peony) stuck in the band of his hat. As the pyenet blooms about Whitsuntide presumably the club walkings which used to take place during that holiday many years ago, provided them with the opportunity for wearing this floral decoration”. Tom’s wife Ann died in Larkland’s Avenue in June 1917 and ten years later Tom married Hannah (nee Harrison). The family members were all regular attenders at the Baptist Church in Queen Street and many of them, including father James, daughter Sarah Ann and son Joseph, were buried in Ilkeston General Cemetery. We now walk further down the road.